Annan Athletic made it 4 straight wins to keep their play hopes alive with a convincing victory over Berwick at Shielfield Park on Saturday afternoon. Manager Jim Chapman’s persistence paid off in securing the services of Josh Todd for this game extending his loan period from Carlisle United to the end of the season and also by the permanent signing of Martin McNiff from Dumbarton. Todd showed his value to the team with a brace and further goals from Steven Swinglehurst and a superb opening strike from Matty Flynn put Annan firmly in the driving seat before Lee Currie scored a consolation goal from the penalty spot in the 64th minute. Berwick started brightly and for the opening 15 minutes Annan found it difficult to impose any authority on the game with Berwick controlling the play but for all their possession Berwick posed no real threat in the final third. The first real threat on goal came in the 4th minute when Kenny Mackay won a free kick 24 yards out but Brannan’s free kick was poor and did not test Michael Andrews making his debut in the Berwick goal. Kenny Arthur punched clear a Lee Currie free kick in the 9th minute and with 16 minutes played Ross Gray’s shot was confidently saved by Arthur. It was Annan who showed the clinical side to their play when they went ahead in the 20th minute. It was a simple goal in the making but the finish was special, when Martin McNiffs throw in was headed clear to the edge of the box and the ball fell to Matty Flynn who’s low crisp clean strike nestled in the right hand corner of the net. Minutes later Arthur denied Lavery who was flagged for offside. Sloan then released Scott Davidson down the right and his cross was defended for a corner, Ally Loves near post corner found Steven Swinglehurst powering in at the near post who steered the ball into the corner of the net to give Annan a 2 goal cushion. Berwick created a good opportunity in the 30th minute when a neat one two opened up the Annan defence but Lavery’s poor finish did not match the build up and Annan were let off the hook. Todd and Davidson combined minutes later for Annan with Andrews pulling off a confident save to deny Davidson. Annan struck again in the 35th minute with a top quality goal. A swift clinical move from defence ended with Kenny Mackay’s weighted pass into the path of Josh Todd and the on loan Todd rounded the keeper to finish with a side foot into the empty net . Ally Love was presented with an opportunity in the 40th minute from a Todd pass but the final shot was disappointing and was easily saved by Andrews. Berwick started the second half like the first taking the game to Annan but again without posing any threat, Andrews was called into action dealing with a 25 yard Kenny MacKay shot. Then as the match approached the hour mark Annan struck again, Scott Davidson was instrumental in setting up the goal with a penetrating run down the left skipping past the challenge of Dunlop and sending in a low cross which the alert Todd once again prodded into the net from a yard out. The match appeared to be out of the reach of the home team but in the 64th minute they were presented with a lifeline when a clumsy challenge by Ally Love on Paul Currie resulted in a penalty kick being awarded which Lee Currie converted. Kenny Arthur pulled off a good save to deny Paul Currie in the 79th minute and at the other end Andrews pulled off a good save to break down a swift Annan attack. With the game heading towards full time Arthur pulled off a good save from a Berwick free kick. 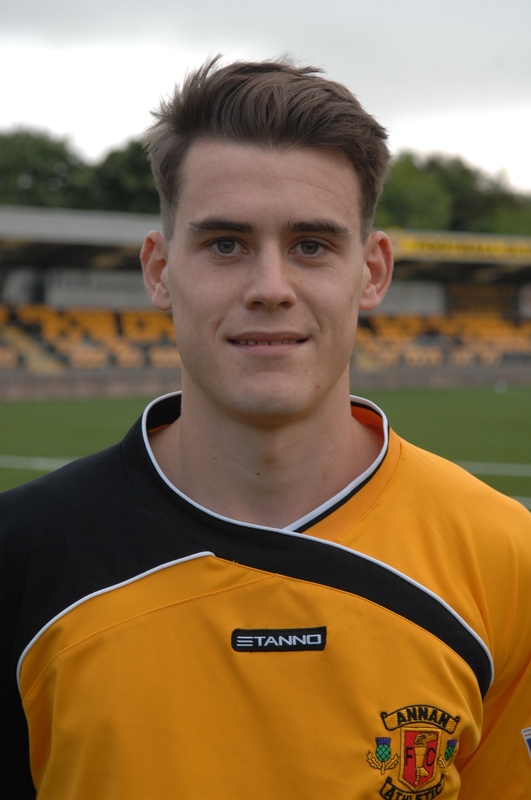 Manager Jim Chapman introduced youngster Dan Wood for his first senior appearance in the final minutes in the knowledge that Annan had secured the points to keep their play off hopes for the time being firmly on course. With Peterhead dropping points at East Stirlingshire, Annan now move to within two points of top spot with a game in hand. Annan manager Jim Chapman commented. “ There are not too many teams who will come down here and return with a result like we have done today. It was a comfortable victory in the end but it was obtained by hard work. We knew Berwick’s strength and we coped well containing them in the opening 15 minutes and then we got the opening goal , we have grinded away, I know we can play a lot better but with that attitude and that spirit we are a hand full. We can’t get carried away, this team is very much work in progress but we are going in the right direction we can take nothing for granted. We know where we are because we are working hard, the spirit and the character in the dressing room is fantastic and the players deserve credit and as long as they keep that up we can only move forward”.